Anyone curious about the natural world would accept that everything in nature is interconnected. And yet, chances are that you have never really thought of your home, garden, or backyard as part of your region's natural system. Adding native flowers around your garden creates habitat for beneficial insects. These insects naturally control populations of pests like aphids - not just in your yard, but in your entire urban environment. Restoration Landscaping is addressing this disconnect by bringing California’s native plants and beneficial insects to urban areas where they no longer exist. We are transforming properties into functional wildlife sanctuaries. Our work is informed by both design and science. We provide a unique design/build landscaping service that balances our need for beautiful outdoor space with an understanding that our urban environment is a part of the natural environment. Our yards, together, are an important place. Our team is comprised of experts in ecology and environmental sciences. We see your landscaping project as an opportunity to address ongoing critical challenges: the impact of drought on plants and soils, species extinction, and collapse of pollinator populations. Working at the property scale with consideration of regional processes and conditions, our mission is to provide mindful aesthetic solutions that will reconnect your home to the broader natural system through a growing network of restored/landscaped sites, designed to harbor flora and fauna that were once common in the region. Humans are part of nature and so are our homes. Around the world, we have altered natural landscapes, causing major ecological disruptions that can only be reversed by the reformulation of urban environments. Contemporary urbanization is now changing the way in which we influence ecosystem functions. For example, urban and suburban landscapes play a significant role in sustaining native plants, birds, and insects, providing benefits that reverberate across multiple levels of the ecological organization. Indeed, the sustainability of natural systems at broader scales is influenced by small-scale restoration/landscaping projects. In areas dominated by agricultural fields - such as the Sacramento area and Northern California in general - small properties effectively function as refuge/habitat for species that otherwise no longer exist in the region. Our goal is to advance the environmental impact of urban and suburban environments in the region, by providing a series of improvements and landscaping services at the property level with consideration of regional challenges. Of particularly importance in California, the effects of drought on plants and soils, and the extinction of key species (e.g., native bees and other pollinators), are central in our restoration and landscape design. Our approach addresses these challenges, while enhancing the beauty of your immediate surroundings, and reconnecting your property to the broader natural system. 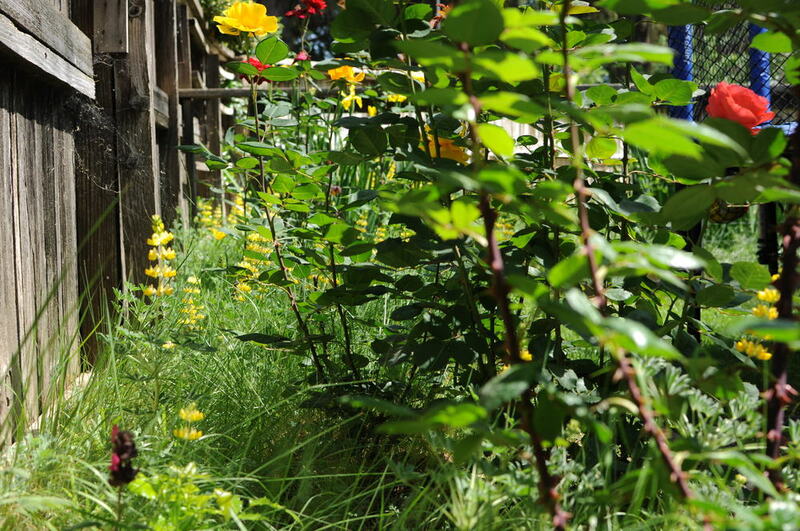 By taking simple steps like replacing invasive ornamental plants with natives, replacing lawns with native wildflowers that are already adapted to the environment, and replacing pesticides with established populations of beneficial insects, we are taking the impact that your yard already has on the natural environment, and redirecting it toward sustainability. A lawn replaced with native wildflowers by Restoration Landscaping Co., Davis, CA. This ecosystem requires only a tiny fraction of the water of a turf lawn; at the same time, it provides habitat for beneficial insects, reducing the need for harmful pesticides. Furthermore, we are committed to following each individual project through periodic surveys, maintenance, and data acquisition, which will be part of a long-term restoration network. As an integral part of this network your landscaping project will contribute to a sustainability plan, pioneered by our team of expert ecologists and environmental sciences at the University of California Davis, who see your landscaping project as an opportunity to address regional environmental challenges. We have the knowledge to start restoring our landscape; your yard is the missing piece of this puzzle. For restoration and landscaping to facilitate urban sustainability, it is important to understand that cities are highly dynamic and currently exhibit new forms and relations with natural environments. The nature and variety of recent urban changes go well beyond the experience of individual properties. We believe that combining a scientific framework in a planned restoration/landscaping design will stimulate urban changes in a direction that will foster sustainable development and improve the ecological significance of your property. We define urban systems as mosaics that encompass developed centers, but which are also connected with agricultural and unmanaged lands. In this inclusive sense, the term urban system stands for extensive areas of human influence. There is also a temporal component of urban systems. This component takes into account that the system can be described with respect to their trajectory, from their segmented origin, through continuous resource inputs needed for developing an interconnected sustainable outcome. Every urban system has institutions for managing the flows of resources, the production of goods, finances, and social interactions. They are also associated with well-established architecture and urban layout. However, the life of urban systems clearly does not end with an ideal, persistent, stable state. For example, many former industrial powerhouse cities lost much of their environmental and economic base, along with large portions of their populations. Therefore, temporal trajectories that characterize the long-term sustainability of urban systems require continuous innovation in order to ensure adjustments in the face of new challenges. One clear trend in modern urban areas is that they have become less dense at their cores, spreading into their vicinities and suburbs. Urban areas are increasingly more connected to the larger global context and to neighboring cities. In the United States, large urban systems are no longer fueled primarily by industry. Instead, today's cities have a more regionally diffuse structure, typically governed by a patchwork of chartered cities, villages, and towns, or counties and regional authorities, along with civil society organizations. The global context calling for improvement of the urban change models is paralleled by novelty of urban patterns around the world. Such new models of urban change and processes may be more useful in charting sustainable urban futures than the declining industrial/urbanization model. For this reason, we have adopted the novel concept of “continuum of urbanity”, which describes the context for applying ecological science toward the sustainable city (Pickett and Zhou 2015). This concept, which is the basis of our framework, emphasizes the biological, physical, and infrastructural processes that integrate the lands and systems within and between urban regions. The continuum of urbanity does not attempt to reinforce and redefine the contrast between urban and rural to fit contemporary reality. Rather it summarizes evolving concepts and insights from a variety of scientific disciplines. This conceptual continuum describes our region as porous, multi-dimensional, differentially connected mosaics in which ecological connectivity is the key aspect of sustainable modern life. A key ingredient in the successful contribution of ecology to urban sustainability is the recognition of the ripeness of our urban areas for transformation. This recognition guides how ideas of sustainability intersect with the concepts of the urban planning and how, in turn, the urbanity continuum advances sustainability. Specifically, the sustainability worldview increasingly applied to urban areas does not mean that a city will be entirely self-sufficient. Rather, it suggests shaping a trajectory that increases sustainability, which can be most effectively achieved by the restoration landscaping of small but interconnected urban areas to foster broad scale beneficial interactions between regional ecosystems and our communities. Utilizing rainwater, this seasonal stream in North Davis is lush, without using any external water. urban design is a tool of human adaptation. These principles, which are based on well-established scientific literature (Pickett et al. 2013), suggest that designing urban systems without explicit consideration of the ecological context will leave cities incomplete and vulnerable. In other words, they will remain unsustainable. Our goal is to use scientific knowledge and the principles of ecological urbanism to reconnect your home's design to the sustainability of our region. Combined, the notions of continuum and ecological urbanism are expressed through superlative improvements in our livelihood, lifestyle, and connectivity with nature. Thus, the two concepts together provide the framework in which can make measurable improvements to our urban experience. Our framework does not replace, but rather gives a home to other familiar urban developments dealing with watershed processes, land cover mapping, and land use classification, among others. This is a huge project - but it starts with small steps. Restoring a small portion of an urban area can have a large effect on the wildlife that entire area supports. This is the future of landscape design. Let's get started.